The engineers at Rolls-Royce had worked their magic. They had somehow managed to squeeze every available ounce of power out of the current Merlin engine and by D-Day on 6 June 1944 the sleek Mk.IX Spitfires of Fighter Command reigned supreme in the skies over Normandy. The magnificent Mk.IXs were, by far, the most numerous variant of Spitfires that fought from D-Day to the threshold of the Reich. In the great drive from Normandy across northern France, Belgium and into Holland the Spitfire pilots of Fighter Command threw down the gauntlet to any Luftwaffe pilots brave enough, or foolhardy enough, to tangle with them. Perhaps the greatest pilot to ever fly the Spitfire was the RAF’s top fighter Ace ‘Johnnie’ Johnson. His resolute determination and steadfast leadership came into its own during D-Day and the subsequent advance through Normandy, and he would finish the war as the highest scoring Allied Ace in Europe. The scene captures the moment when, as Wing Leader of 127 Canadian Wing, Johnnie is seen leading Mk.IX Spitfires from 421 ‘Red Indian’ Squadron RCAF out on patrol from their airfield at Evère near Brussels on a cold December morning in 1944. It is close to the fighting and the German front line so, as the Canadians climb steadily out over the snow clad landscape in the golden light of dawn, they are already alert and on the lookout for the first signs of trouble. Robert Taylor’s Masterwork has been specially commissioned in tribute to Johnnie Johnson and to commemorate the heroic role played by the pilots who flew the Spitfire on D-Day and the great Allied push from Normandy. Prints in this magnificent new release have been personally signed by a number of the decreasing band of Spitfire pilots who flew and fought over Normandy, including the top Ace ‘Johnnie’ Johnson himself, who endorsed the content and publishing of this edition before he sadly passed away in 2001. The signature of such a great legend adds enormous distinction, value and historical importance to this new collectors’ piece. 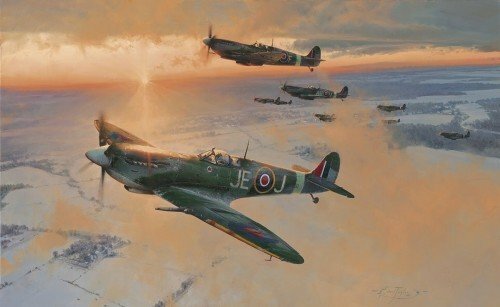 Every print has been personally autographed by artist Robert Taylor and by FIVE prominent Pilots that flew the Spitfire during D-Day and Normandy, including the RAF’s top fighter Ace ‘JOHNNIE’ JOHNSON. Flew offensive sweeps on D-Day / 4 confirmed victories. Flew fighter patrols on D-Day and throughout the Allied invasion. Flew anti V1 patrols and low level strafing attacks over Normandy / 4 victories and 3 damaged. Undertook photo-reconnaissance missions before during and after D-Day, was shot down over Germany. Wing Commander J.F. ‘STOCKY’ EDWARDS DFC* DFM / 16½ victories. Wing Commander JAMES D. LINDSAY DFC / 9 victories. Lieutenant General DON LAUBMAN DFC* / 15 victories.